In our reporting, we include the current top-20 World Greco-Roman rankings assigned to each competitor by United World Wrestling. The global sanctioning body’s rankings are not infallible but have improved in their transparency. Previously, the methodology applied to determine an athlete’s ranking was based heavily on subjectivity. Achievements/performance results, either acquired during a specific season or throughout one’s career, represented the base criteria in how rankings were decided. The primary complaint about this system resided with inconsistency. Wrestlers who were injured and therefore inactive, or unable to travel to events due to scheduling conflicts, oftentimes kept a high ranking while others in their respective weight classes remained competitively successful but were not duly rewarded with improved placement. To be sure, United World Wrestling’s former ranking system was still respected, effective, and served to create the kind of debate among the sport’s populous that never ceases to be vital. However, because there are implications attached to World Greco-Roman rankings in regards to team selection processes for various nations, as well as opportunities for competition and in some cases financial incentive, a subjective ranking system may not be entirely appropriate at the Olympic level. As such, subjective rankings were eliminated in 2018. Beginning in 2018, United World Wrestling officially rolled out its “Ranking Series”, a collection of international events with each offering point values related to wrestlers’ placements. There are two tournament types that will always remain on the Ranking Series calendar — World Championships/Olympic Games and Continent Championships (European Championships, Asian Championships, Pan American Championships, etc.). In addition, four events spaced out through the season and taking place in different regions shall also be included. For example, 2018 saw these four tournaments branded as Ranking Series events: Takhti Cup (Iran); Granma Cup (Cuba); Hungarian Grand Prix (Hungary); and Vehbi Emre (Turkey). Events offered as part of the Ranking Series may be subject to change in the future, and more events may be added, as well. 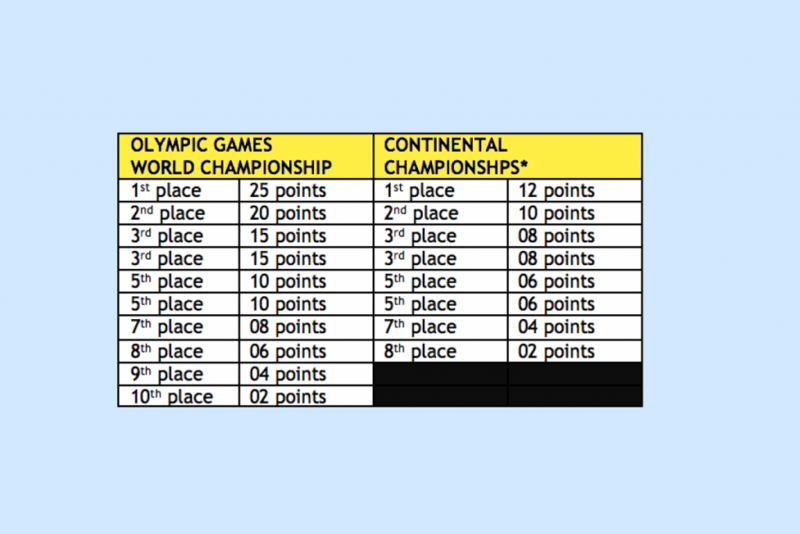 UWW Ranking Series point values for World/Olympics and Continental Championships. (Chart: UWW). World Greco-Roman rankings are a valuable tool when it comes to illustrating reference points. Including a ranking next to an athlete’s name in the context of a particular competition serves as an indication of an athlete’s status during that season. For instance, a summary about the Granma Cup may help a reader understand the prowess of a specific wrestler [i.e., John Doe (USA, world no. 7]. It doesn’t mean that the greater wrestling community as a whole actually believes in or agrees with how high or low a wrestler is ranked, but it is the recognized standard the sport uses to measure competitive success during a given time-frame. Ranking can also be useful when looking back at event results from previous years. Once again, when operating in this fashion, there is a story to be told. You may notice in an article from 2016 that a wrestler was ranked 16th by UWW, but in 2018 he had shot all the way up to 4th. It is our hope that this small but important piece of information will foster more interest and curiosity about Greco-Roman athletes along with the sport itself. In summary, our reporting style is such that we do abide by the UWW’s Greco Roman rankings because they help paint a picture for our readers as well as those new to Greco wrestling altogether. Only wrestlers ranked in the top-20 by United World Wrestling receive a ranking designation next to their name on Five Point Move. As per our style guide, USA athletes will have club/sponsorship listed instead of country code. Example A — international competitor. Example B — USA competitor. Five Point Move will include the UWW Greco-Roman ranking assigned to each wrestler if they compete in a non-Olympic weight class. When it is an Olympic year and an athlete from a non-Olympic weight moves to a different class, we will still include that ranking with the note that it is at the other weight (e.g., John Doe, USA, world no. 7 at 72 kg). If an athlete competes at a different weight other than the one they are ranked in, that ranking will be included similar to the example presented above.